1. 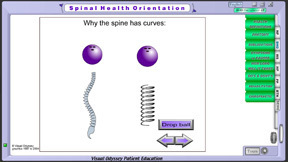 The Spinal Health Orientation (SHO) was a popular flip chart poster system that has been used for 100s of thousands of lectures and daily discussion since 1987. It has been in our software since 2001. 2. There's a special module for educating young children and showing their parents. 3. The Work Safety helps you present to warehouse / factory type workers plus office workers. Enjoy up to 60 unique Daily Visit Discussions that are fingertip accessible and customizable. You'll have hundreds of images, and animations just waiting to help you keep your patients engaged. Or ... Take your show on the road and build your community awareness through screenings and lectures. All these presentation graphics can be seamlessly integrated with the Neuropatholator ROF to design a limitless number of talks and workshops. Even add your own images and videos. Your audience receives an indelible experience that is is instant, dramatic and memorable all on your monitor. * Upgrade to the Gold at anytime.